In this exclusive audio interview Emmy Winner Charlotte Robinson host of OUTTAKE VOICES™ talks with Robin Lowey about her book "Game Changers, Lesbians You Should Know About” that morphed into her panel at ClexaCon, Las Vegas on April 6th. Lowey is a graphic artist who was inspired to create this book after the Fair, Accurate, Inclusive and Respectful Education Act was signed into law in California in 2011. The legislation requires state curriculum to include contributions of LGBTQ people into textbooks. 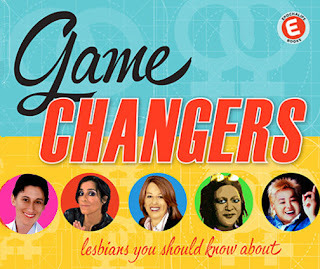 “Game Changers, Lesbians You Should Know About” is laid out in a whimsical fashion with colorful graphics and even a card with factoids about each woman featured. Lowey raised more than $20,000 through crowd funding to publish her book and she’s in the process of giving the book to all the public high schools and community colleges in Marin, San Francisco, Berkeley and Oakland. She hopes her book will help young people learn more about our LGBTQ history. ClexaCon is the annual media and entertainment convention for LGBTQ women and allies that brings together over 3500 participants from over 40 countries and all 50 U.S. states to celebrate the best of LGBTQ+ TV and film and discuss how to improve representation across all media platforms from April 5th to 9th in Las Vegas at the Tropicana Hotel. Robin’s panel at ClexaCon is entitled “Game Changers – How These Outliers Impacted Queer Culture” and will address our community before Ellen, The L Word and Orange Is The New Black when lesbians were often at great risk in pursuit of community and culture. Many women lost their jobs, were thrown in jail and kicked out of families when their identities were revealed. Nevertheless they persisted. This is an opportunity to hear the stories of lesbians and lesbian culture that paved the way for where we are today. Lowey will be joined by journalist Kathy Belge and Emmy Winner Charlotte Robinson who will share their experiences throughout the decades. We talked to Robin about her inspiration for writing this fabulous book, what she hopes to accomplish at ClexaCon and her spin on our LGBTQ issues. 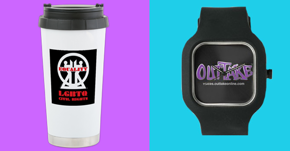 Robin is a fun and very heartfelt contributor to opening minds and hearts through her writing and community actions. Can't wait for the Convention in April.